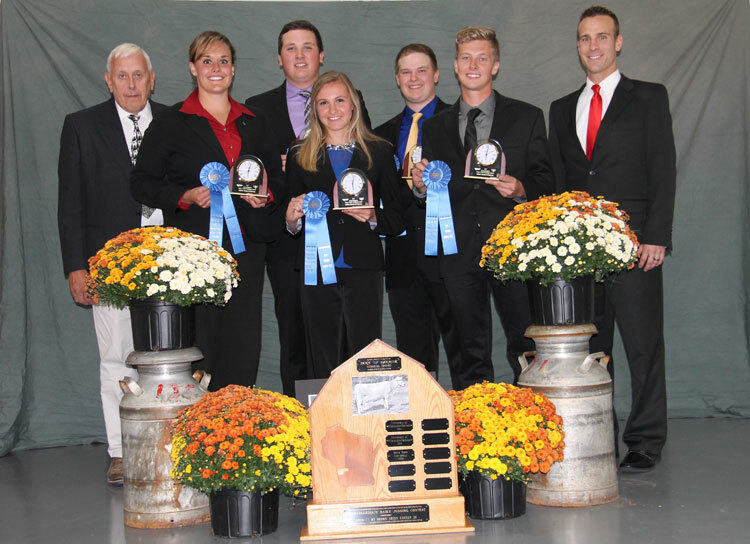 The 24th Annual Accelerated Genetics® Intercollegiate Dairy Cattle Judging Contest hosted with East Central/Select Sires® was held September 17, 2017 in Viroqua, Wis., with Iowa State University taking top honors as the overall contest winner. The Iowa State University team, coached by Christen Burgett, includes the following members: Mason Lettinga, Kyle Kass, Emily Irwin, and Nicholas Schiller. Placing second overall and first place in reasons was University of Minnesota coached by Les Hansen. Team members included: Megan Hill, Krista Styer, Gabriella Sorg and Laura Jensen. The top overall individual award went to Mason Lettinga from Iowa State University. The other top individuals included (listed in order from 2nd-5th): Erica Helmer, University of Wisconsin-River Falls, Emma Olstad, University of Wisconsin-Madison, Kyle Kass, Iowa State University, and Laura Jensen, University of Minnesota. In the oral reasons competition, the top three individuals received a special scholarship from the James W. Crowley Fund. This year’s top three individuals were: Laura Jensen, University of Minnesota, Mason Lettinga, Iowa State University, and Gabriella Sorg, University of Minnesota. A total of 12 teams participated in this year’s contest representing the states of Illinois, Iowa, Kansas, Minnesota, South Dakota, and Wisconsin. 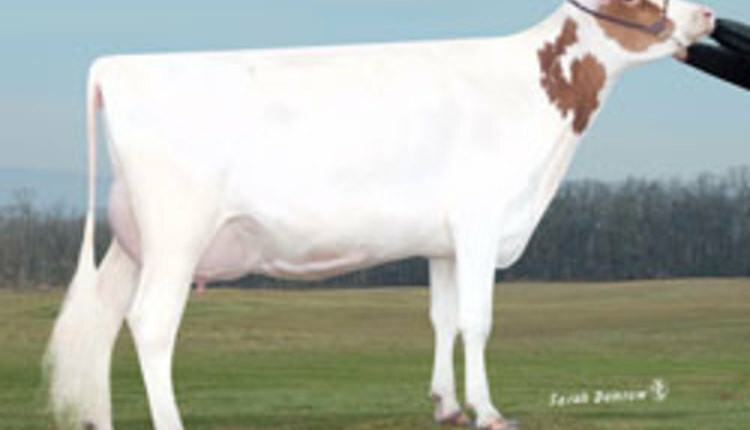 They judged the following dairy breeds: Guernsey, Holstein, Jersey and Milking Shorthorn. Each participant placed 10 classes and gave five sets of oral reasons. A key part of the judging contest is the youth who serve as leadspeople. Each year, Vernon County youth assist with the contest by leading the cattle – this year 22 youth participated. Showmanship awards were given to the youth based on their skills exhibiting the cattle and sportsmanship. In the Junior Showmanship Division Emilie Brose placed first, Karly Anderson placed second and Ty Harbaugh placed third. Placing first in the Senior Showmanship Division was Hope Petersheim, second place Grant Fremstad and third was Lucas Anderson. 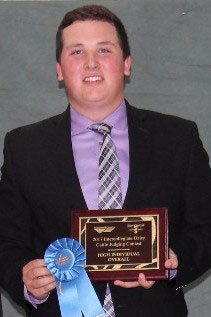 The Overall Showmanship Winner was David Petersheim who received the David Larson Memorial Showmanship Award. This special award is given in memory of David Larson who devoted his life to the betterment of the agriculture industry and the judging contest by working with and developing Vernon County youth. The Intercollegiate Dairy Cattle Judging Contest would not be possible without support from numerous contest and award sponsors. This year they included Accelerated Genetics®, Activon/EfferCept®SG, Agrarian Solutions/Convert™/Biocycle™, American Guernsey Association, American Jersey Cattle Association, American Milking Shorthorn Society, Brown Swiss Canton III, Church of Christ, East Central/Select Sires®, Form-A-Feed, Inc., Hampel Corporation, Holstein Association USA, James W. Crowley Fund, Lake Prairie Marketing Group/Julie Steffeny, Milk Products, Inc., Rockway, Inc.,/Estrotect™, Star Blends, UdderTech®, and the Vernon County Agricultural Society. Accelerated Genetics is a global provider of bovine genetics and research, reproductive services, and solution-based herd management products. With a focus on People, Products and Pride, the Accelerated Genetics vision is to be the producer’s trusted first choice.